Vera Cooper Rubin (July 23, 1928 – December 25, 2016) was an American astronomer. She discovered dark matter. Rubin was born on July 23, 1928. Her parents were Rose Applebaum and Phillip Cooper. At age 10, Rubin became fascinated by the stars in her home, Washington, D.C. At age 14, she built her first telescope. Rubin attended Vassar College where she earned her B.A. in 1948. She earned her M.A. at Cornell University in 1951. She received her Ph.D. in astronomy at Georgetown University. At Cornell her thesis studied evidence of bulk rotation in the universe. Rubin taught at Georgetown before becoming a researcher at the Carnegie Institution of Science. She spent a year as a teacher in math and physics at Montgomery County Junior College. She contributed to newspapers. 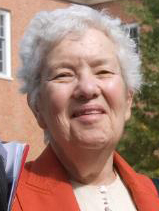 She was an associated editor of the Astronomical Journal and the editorial board of Science Magazine. Rubin was on the astronomical committee at Harvard University and at the National Academy of Sciences. Rubin was an American astronomer who discovered dark matter. Dark matter is a material in the universe that does not reflect light. She and W. Kent Ford found that the stars closest to the center of the galaxy and the stars farthest from the center of the galaxy moved at the same rate. Their findings said that mass astronomers could see only 10 percent of the galaxy's total mass. This makes dark matter invisible. Rubin joined the council of American Women in Science in 1984 to promote women in astronomy. Rubin was given honorary degrees from Creighton University, Harvard University, and Yale University. She won the National Medal of Sciences in 1993. Rubin was married to Robert Rubin, a physicist. She wrote a children's book on astronomy to encourage young girls to study science. Rubin had four children named David, Allan, Judith, and Carl. Her children all became scientists. Rubin died in Princeton on December 25, 2016. ↑ "Vera Cooper Rubin." Student Recourses in Context. Gale. Mar 31, 2017. This page was last changed on 2 October 2018, at 20:29.